The Snowdonia National Park is much more than the highest mountain in England and Wales. Mainly mountainous, it encompasses a large area of beautiful and often spectacular wild landscapes. Located in North Wales, the National Park offers a tremendous variety of walks with many challenging mountain routes. Snowdonia is a complex area of mountains in the northern half of Wales, which is more conveniently analysed by dividing it into smaller sub-regions. Without doubt the highlight is the Snowdon massif itself rising to the airy summit of Yr Wyddfa (Snowdon) at 3559ft (1085m.) - the highest point in England and Wales. Elsewhere in the National Park there are many tempting summits each with its own character together with some wild upland country. The Snowdonia National Park is a great area for high level walks with plenty of choice terrain and scenery. However in periods of poor weather there is less choice of routes at lower levels, something which needs to be considered if staying in the area for more than few days. The regional split is relatively straight forward with the individual mountain ranges falling into a series of logical groups. These have been loosely listed in a north to south direction to help those unfamiliar with the area to find their way around. The Carneddau - the largest area of high land in England and Wales. With seven summits over 3,000 feet the area cannot fail to attract walkers. Much of the eastern area is quite rounded in form but as you traverse westwards to the A5 main road the terrain becomes increasingly more rocky. The highlight for me is the section from Pen yr Ole Wen to Carnedd Llewellyn where dramatic rock scenery provides excellent views over the neighbouring Glyders and the Menai Straits with the Isle of Anglesey beyond. The Glyders - a small area but packed with interest. With no less than five summits reaching the magic 3,000 feet this is another area well worth studying in detail. Glyder Fawr and Glyder Fach are wonderful rocky tops strategically positioned between the Carneddau and the Snowdon massif. Tryfan is one of the great mountains of Wales with excellent scrambling. The remaining high peaks, Y Garn and Elidir Fawr are contrasting mountains each with its own character. For those short of time a short stroll from Ogwen Cottage to the shores of Llyn Idwal will provide a perfect introduction to this range. Snowdon - Yr Wyddfa is bound to attract the crowds but it is not the only peak in the range. Crib Goch with its knife-edge ridge is one of the great places to be but only if you can stand the exposure. Elsewhere Yr Aran, little visited and quiet, stands as a lonely sentinel offering great views over Moel Hebog with the village of Beddgelert below and an excellent perspective of the south face of Snowdon. To the north Moel Eilio and Moel Cynghorion provide excellent walking with fewer people making the effort to walk their paths. Moel Hebog - The Nantlle Ridge is the highlight of this range. Taking in six summits over 2,000 feet the ridge runs south west from near the village of Rhydd Ddu with the highest point reached at Craig Cwm Silyn (2408 ft). Somewhat overshadowed by the delights of the Nantlle ridge, the highest peak of the range is Moel Hebog (2565 ft), which is a popular summit offering good views across northern Snowdonia. The Moelwyns - Moel Siabod stands in a solitary position with wide ranging views to the Glyders, the Carneddau and Snowdon. It is the highest member of the group at a very respectable 2860 feet. Other notable peaks include Moelwyn Mawr and Cnicht with its unusual pointed outline when viewed from the valley at Croesor. Allt-fawr, Moel Druman and Ysgafell Wen are also worth a visit. Relatively un-walked they offer a fine view across to Snowdon. Sadly some of the this area has been blighted by slate working especially around Blaenau Ffestiniog. However slate working in some parts of the range has added extra interest to the area. The Arenigs - Little visited this range still provides some excellent mountain walking. The highest peak is Arenig Fawr at 2801 feet. When viewed on the approach from Bala this is an impressive mountain. Other summits are rarely mentioned in guide books and are thus rarely visited so perhaps they may be ideal places to escape the crowds. The Berwyns - Located outside the borders of the Snowdonia National Park and often branded as "boring". That may be true for some of the summits but Cadair Berwyn and its immediate vicinity is wonderful mountain scenery, although not as rugged as some of its near neighbours. Elsewhere rounded heather-clad mountains provide excellent views but their lack of crags does not make walking them an inspirational experience! The Arans - The highest summit is Aran Fawddwy - an airy top to the south of Lake Bala. Its associated ridge is fine walking country that is now accessible with the Right to Roam Act. The highest summit south of Snowdon, it is only 31 feet short of the 3,000 ft threshold. Other peaks in this range are all worth exploring although the lack of paths may deter some people from these hills. The Rhinogs - This range has a Jekyll and Hyde character. In the southern part of the range, Y Llethr and Diffwys are comparatively smooth and grassy providing good walking in wonderful surroundings. To their north, Rhinog Fawr and Rhinog Fach are rugged rocky mountains making every step forward a challenge. Gaining in popularity this is an area for the connoisseur. Cadair Idris - The most southerly range in Snowdonia. 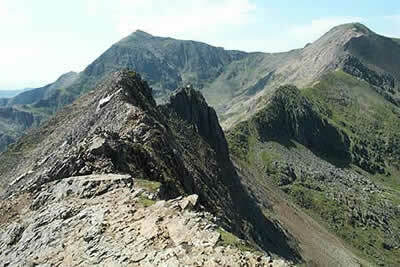 The major attraction is Cadair Idris, which can be a very busy peak in good weather. With interesting routes from north and south this is an excellent major peak to visit. Other lesser summits in the range also offer much to see and do with some wonderful craggy cwms cut into the mountainsides.